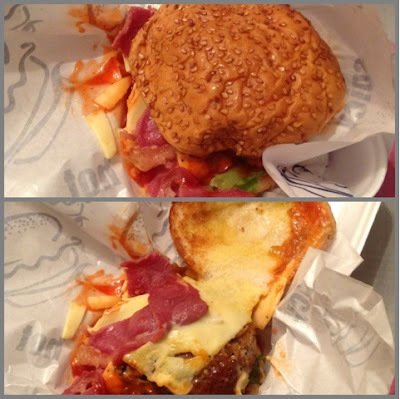 Rawang Burger Bakar located at Wangsa Maju (and not Rawang) is located at Seksyen 5. It is right at the traffic light at the Shell intersection. You won't miss the place if you're familiar with Wangsa Maju. Depending on the time you visit the place, the queue can be quite long. I waited for almost one hour for my burger. There are beef or chicken burgers with different combination. For example, the beef burger I had was called 'Ombak Rindu' which cost around RM9 with cheese and beef bacon. Why should you visit Rawang Beef Burger? The homemade beef and chicken patty are just yummy.